Our nation’s infrastructure is at risk. Earning a D+ in the 2017 Infrastructure Report Card, very little progress has been made towards restoring America’s failing infrastructure. Ohio’s ability to adequately maintain its failing infrastructure has been called into question as well. Nearly 7% of Ohio’s bridges have been deemed structurally deficient. Driving on deteriorating roads is costly to citizens, and aging infrastructure threatens the quality of life of all Ohioans. Additionally, failing infrastructure can be extremely detrimental to economic health by deferring new businesses and residents. If not dealt with in the short term, infrastructure can pose a much greater threat in the long term. By delaying action, the costs and risks of an aging infrastructure system escalate, and the solution to the issue becomes more complex. 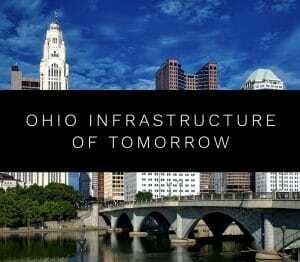 In order to compete in an increasingly competitive global market, Ohio leaders need to be proactive and invest in infrastructure. Possible solutions laid out by the American Society of Civil Engineers include raising the federal motor fuel tax, increasing investment, and prioritizing infrastructure related projects through asset management best practices. The motor fuel tax in Ohio has not been modified since 2005, leading many legislatures to call for a raise to increase funds for Ohio’s deteriorating roads. However, as more fuel-efficient vehicles hit the road each year, many question the long-term sustainability of funding from a gas tax. Failing infrastructure also allows for new creative strategies. For example, water infrastructure is seeing “green” alternatives to traditional storm water filtration. Many hope Governor-elect Mike DeWine will restore cuts to local government funding made under Governor John Kasich. While DeWine has made no promise to restore the funds, he has offered his partnership with local governments when it comes to restoring their failing infrastructure. He also calls on Congress to pass an infrastructure bill. While no government officials want to tell Ohio constituents they have to pay more for infrastructure, the longer they delay action the worse the problem will become.